Kleefeld on Comics: "Hi. 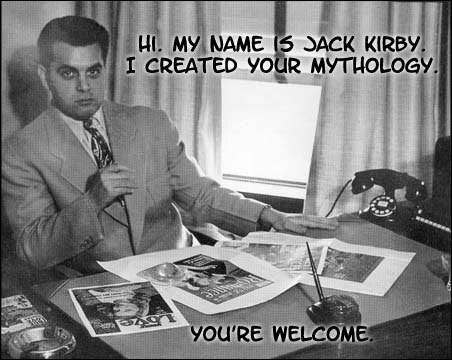 My Name Is Jack Kirby." OK, this is totally not the type of thing Jack would've been likely to say, and it's a dramatic oversimplification, but it seemed like a fun way to highlight that his birthday is coming up on the 28th later this month. TwoMorrows is having a 40% off sale until then on all of their Jack Kirby books and magazines. There's lots of fantastic material in there, despite my having contributed to some of the mags. Pretend you don't know I write for Jack Kirby Collector and order something anyway.